HOLTON – For the first two quarters, it seemed like Holton would have no problem locking up its fifth win of the season and moving within a victory of clinching a playoff berth. But Lakeview found its offense in the second half, and the host Red Devils had to go to work to earn an important victory. But they held on for a 34-24 victory in CSAA Silver Division play, setting up an exciting matchup next Friday. Holton, 5-1 overall and 3-1 in the conference, will visit undefeated Kent City next week with a chance to win a share of the Silver title. A victory would also give the Red Devils their first playoff berth since 2007. Lakeview silenced the large Red Devils crowd early when Bailey Harris returned the opening kickoff 90 yards to the Holton 2-yard line. 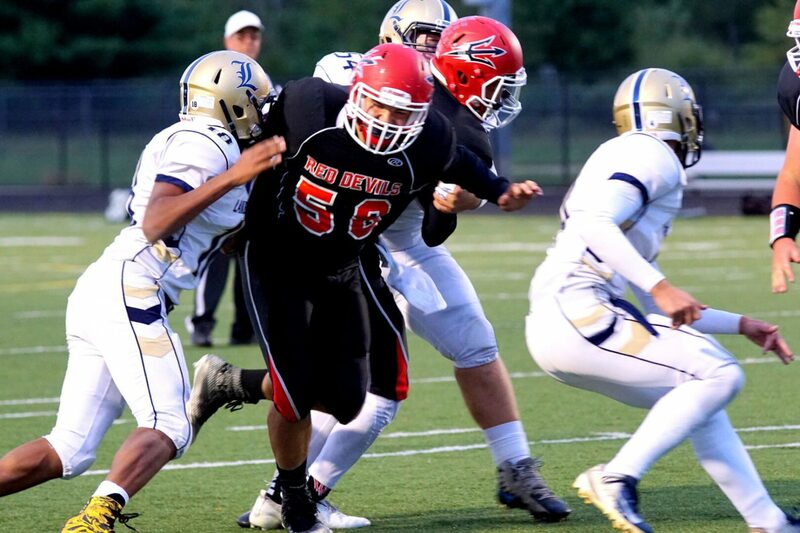 But the Red Devils defense stuffed four consecutive running plays and took over on downs. Holton picked up two first downs before punting, but Harris fumbled the punt and the Red Devils recovered at the Wildcats’ 33. Ten plays later, Holton’s Aaron Herron rushed up the middle for an 11-yard touchdown run and a 7-0 lead with 2:09 left in the opening quarter. The teams exchanged punts before the Red Devils got the ball back with five minutes left in the first half. Holton used a nine-play, 63-yard drive to take a 14-0 lead on quarterback Drew Trygstad’s 2-yard run with 35 seconds left in the half. The Red Devils got the ball to start the second half, but lost a fumble on its second play. The turnover seemed to spark the Wildcat offense, which had one yard of offense in the first half. Lakeview picked up 68 yards on the next three plays, culminating in a 31-yard TD run by Addison Mitchell to cut the lead to 14-6 just 1:06 into the third. Holton responded with a 13-play, 61-yard drive that ended with a four-yard TD run by Derek Pouch, giving the Red Devils a 21-6 lead with 5:01 left in the third. The Wildcats answered with a five-yard touchdown run from Harris, to cut the lead to 21-12 with two minutes left in the third. But the Red Devils quickly responded on the ensuing drive. On the first play of the fourth quarter, Herron broke around the left end and sprinted 33-yards to the end zone, and the hosts had a 28-12 lead. Two plays later, Lakeview responded with a 64-yard score from Mitchell with 10:56 left in the fourth, pulling the Wildcats to within 28-18. Nursing the 10-point lead, and looking to run the clock down, Holton faced a 4th-and-2 from its own 29-yard line with 4:30 left in the game. Nummerdor sent the punt team in before calling a time out and discussing the decision with his offense. The players changed his mind and were send back on the field to pick up the first down. Herron took the handoff, broke around the right edge and sprinted untouched down the sideline for a 71-yard TD to give Holton a 34-18 advantage. Harris added a Lakeview score with two minutes left in the game to make the score 34-24 with 2:02 left, but the Wildcats were unable to recover the onside kick, and the Red Devils ran out the clock. Holton finished with 441 total yards, including 382 yards rushing on 46 carries. Herron led the offense with 253 rushing yards on 23 carries, Pouch added 123 yards on 19 carries and Trygstad was 3-for-5 passing for 59 yards. Lakeview finished the game with 290 total yards. On one of the picture it says kolten please can it be changed to anthony crabtree because that is who got through the line.